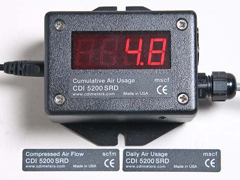 The CDI 5200-SRD summing remote display provides a convenient way to monitor daily or cumulative air usage by a machine, process, or department. Alternatively, it can be used as a remote display for a meter in a high or inconspicuous location. When installing the display, the user selects the display mode and labels the unit accordingly. In the RATE mode, the unit simply repeats the output, in scfm, of the connected CDI 5200 or 5400 flowmeter. Used in this mode, the display provides a convenient way to monitor the flow at a meter that is high above the factory floor.